Adapted from the autobiographical novel of the same name and following Franklin J. Shaffner’s 1973 film, Michael Noer’s remake of Papillon follows the story of safe cracker and thief, Henri “Papillon” Charrière as he serves out his sentence in a penal colony in French Guiana. Desperate to escape, Papillon befriends nerdy master forger, Louis Dega who offers him money in exchange for his protection. The two unlikely partners in crime are confronted by obstacles that thwart their attempts to escape the notorious work camp. Complete with its guillotine, which stands proud in the courtyard, the camp offers severe punishments to those who step out of line. After a lengthy stint in solitary, hope for Charrière’s escape begins to dwindle. Fans of the original film may struggle to let go of Dustin Hoffman and Steve McQueen as the eponymous duo but Hunnam brings a ferocity and confidence to the role, however, perhaps that’s not quite enough to keep audiences engaged for over two hours. 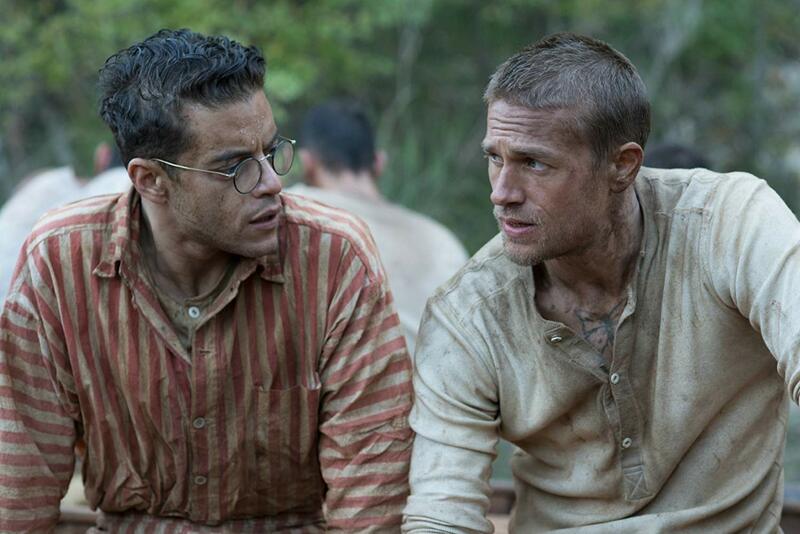 Scenes of Papillon’s solitary confinement dominate a large portion of time which could have used to further establish the relationship of the protagonists or delve deeper into life at the work camp, or in fact, just cut down. Despite being shorter than the original, it feels much longer. You can’t get away from the fact that the story itself is extremely entertaining and therefore will offer plenty of what you’d expect from this type of film. There are certainly gripping moments, you can’t help but sit there in solitary with Papillon as his mind begins to be warped by the darkness (Malek as a mime will forever haunt you). There’s a relationship between the two characters that seems genuine in the story’s context. Noer has attempted to revamp its predecessor while still remaining true to the story, he does this to a certain extent and the performances, from Hunnam especially, are strong and would have flourished in a different film, but Papillon’s downfall was following an already successful film and I think the question is, why did this need to be remade?